Kat Krazy are one of the UK’s biggest house music exports of recent years, fusing the euphoric sounds of the genre with pop music to great effect. Remixes for some of the world’s biggest acts like Coldplay, One Direction, Ariana Grande and Iggy Azalea have made them the go-to producers for pop stars wanting a hot dance mix, and their versions receive as much support on the radio as they do in the clubs. With a sound that combines intricate production with big grooves, fist-pumping pianos and joyous melodies, they have also captured the imagination of many of dance music’s biggest DJs and producers. Tiësto and Armin Van Buuren are amongst the duo’s supporters, with the latter signing their original track Siren (feat. Elkka) to his enormous Armada imprint and gracing it with his very own remix. Kat’s remix of Bastille’s Pompeii was one of their biggest moments, hitting No.1 on the US Billboard Dance Chart and amassing a staggering 30 million plays online to date. More recently, they have been reworking some of the hottest names of the moment, including Krept & Konan, Tom Odell and Ella Eyre. 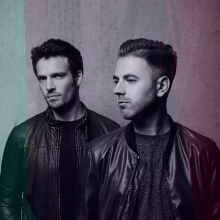 Their original productions continue to grow in stature, with Run Run receiving heavy support on Radio 1, and follow-up We Stand Upon the way featuring Ina Wroldsen, writer and vocalist on Calvin Harris & Disciples’ How Deep Is Your Love. With props for their work coming from the likes of MTV and Popjustice, their acclaim is coming as much from the press as it is from their burgeoning fanbase and with such a prolific and high-profile output, it doesn’t look like it’s in any danger of waning.